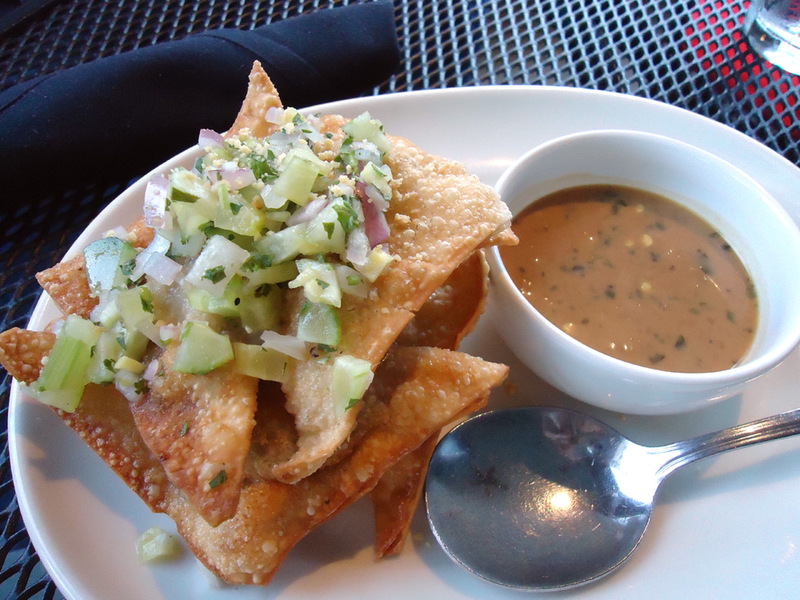 If you haven’t had a chance yet or you’re heading to Greater Raleigh this weekend you absolutely need to take advantage of Triangle Restaurant Week, which ends on June 10. Restaurants throughout the Triangle are offering special fixed-price, three-course meals. Adam and I participated in Triangle Restaurant Week by visiting Fork and Barrel in North Raleigh. We sat outside on the patio to enjoy the beautiful Raleigh weather. The atmosphere of the restaurant is laid-back, and it’s the perfect place to meet up with a group of friends. You won’t have trouble finding something to order because the menu is massive: sandwiches, entrees, burgers, salads and food galore! Thank goodness for Fork and Barrel’s Triangle Restaurant Week menu; the options are limited so it narrowed things down for this highly indecisive Foodie. Adam ordered the fire cracker pork dumplings for his appetizer. The dumplings were crispy, filled with spicy pork and topped with a cool cucumber relish. The peanut dipping sauce was delicious and paired nicely with the heat of the pork. This savory, spicy appetizer is a must and definitely one that should be split. I ordered the bruschetta, which was nothing like I expected (in a good way). Usually I imagine bite-sized pieces of extremely crunchy bread topped with some veggies. 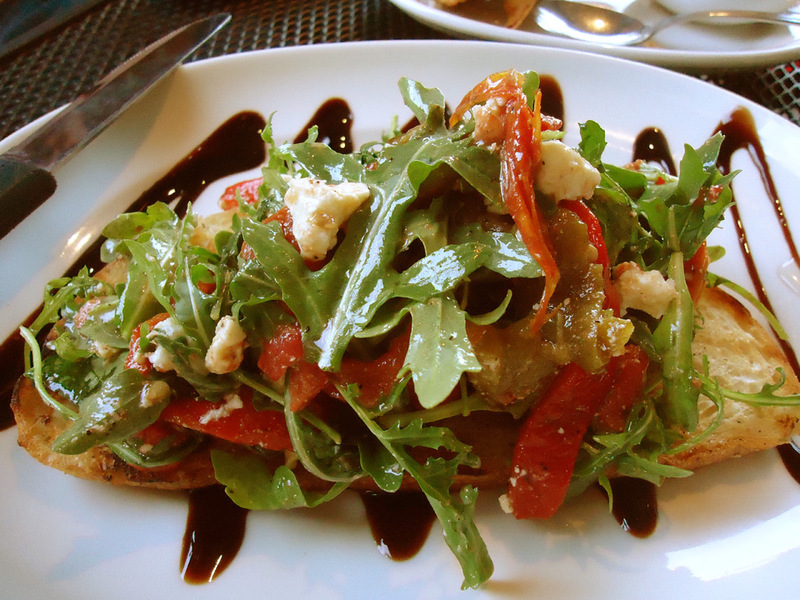 When the bruschetta arrived, I was pleasantly surprised by the big piece of grilled bread piled high with arugula, feta cheese, herbs and roasted peppers, tomatoes and garlic. The bruschetta was fantastic and the perfect way to start off my meal. I especially enjoyed the flavor of the roasted tomatoes and peppers in the dish. Adam chose the vegetable ravioli for his entrée, which included fresh spinach, grilled Portobello and local goat cheese. 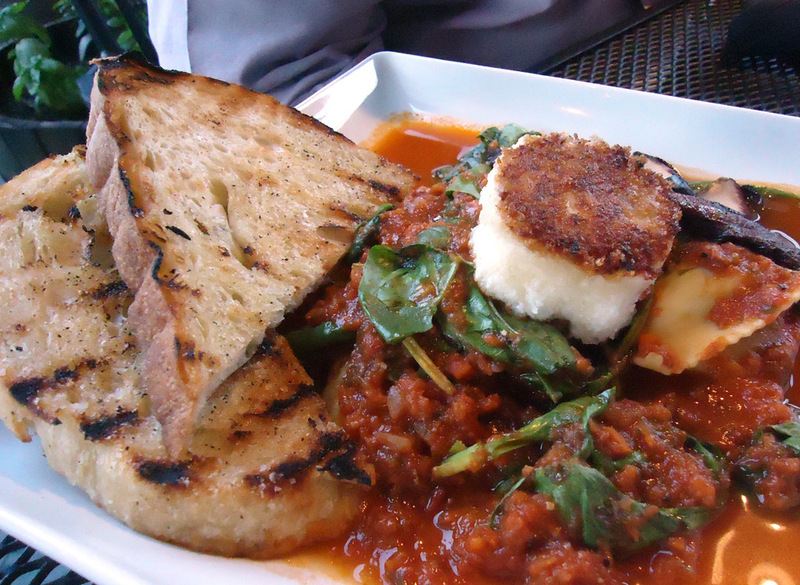 The balsamic tomato sauce served over the ravioli was excellent and added a sweet element to the dish. I was impressed with the grilled salmon salad. 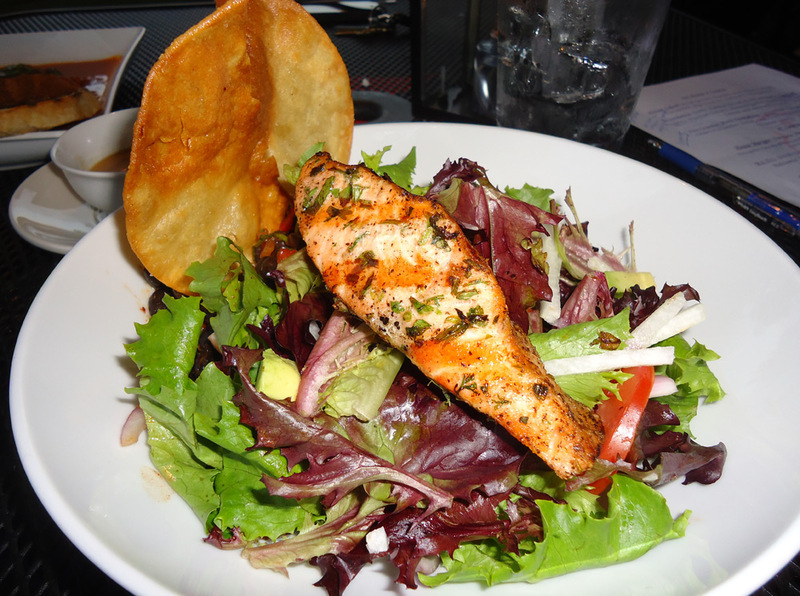 The marinated salmon was served on top of a bed of lettuce, avocado, tomato, red onion, jicama and black beans. The charred jalapeno vinaigrette added the right amount of heat to this tasty southwestern salad. Adam ordered the dark chocolate crème brûlée for dessert. 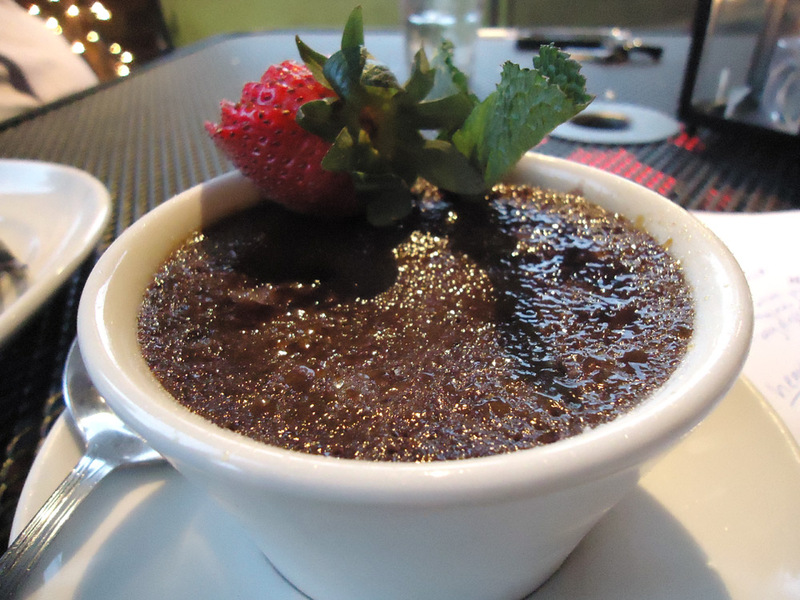 The dessert was light, and the dark chocolate added a subtle and sweet cocoa flavor. The strawberries were decorative and went along nicely with the chocolate. My favorite part of the entire meal was definitely my dessert. I have a ridiculous sweet tooth, which was satisfied by Fork and Barrel’s incredible cheesecake. 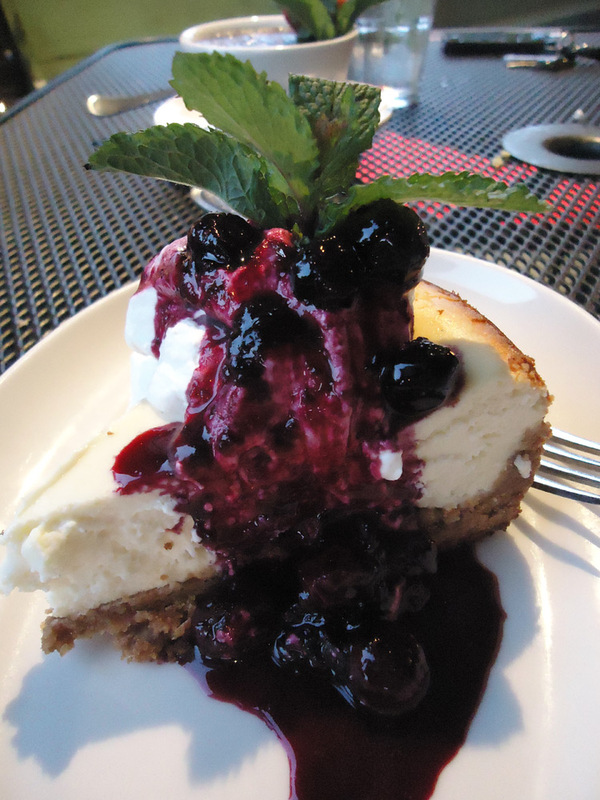 The cheesecake was made with local goat cheese and topped with North Carolina blueberries. The goat cheese added a unique element to the dish and wasn’t overpowering. I never wanted this dessert to end! Pay Fork and Barrel a visit next time you’re in North Raleigh. The food is all made from scratch with a focus on using fresh and local ingredients. There’s definitely something for everyone!